Farmers markets are important marketplaces for local growers and producers, but they can also be vital community gathering places — offering nourishment, enjoyment, and educational experiences. The organizations, government services, and small businesses that serve the community can play a role in bringing more value to farmers markets, offering workshops or providing information on relevant topics like composting and vermiculture. Groups are required to pay a table fee. Fees allow us to pay for market insurance, grounds maintenance, market management, printing costs, and publicity. Groups are allowed to come up to once a month. Please bring your own tables, chairs, and signage. There is limited space at the market and so tables are at a premium. The Farm Fresh RI market manager will show you your designated spot to set up. Our goal is to foster markets with a diversity of locally grown and produced foods that are accessible to all segments of the population and unrivaled in quality and freshness. Failure to comply with the following requirements degrades the market and will jeopardize participation. Set up a table display and hand out literature. Sell non-food items related to your group’s mission, as long as they do not interfere with other vendors (provide RI Sales Tax Permit where applicable). Register people for SNAP, WIC, or other government aid programs. Solicit aggressively—no cornering customers, no shouting, no following customers beyond your table. Your organization should be based in Rhode Island and its mission must focus on food, health, the environment, rural communities, cities, or public spaces. Consideration will be given to how the group relates to our mission and our goals for a given farmers market, and the relationship of the group to the neighborhood and community of the market. Acceptance into the market is at the discretion of Farm Fresh Rhode Island. Civic groups are expected to provide their own equipment. A table is required. Electricity will most likely not be available for your use. The market manager will determine the location of a civic group at the market. The needs of our farm and food vendors take precedence over the needs of community groups at all times. Farm Fresh RI can approve an application for an informational display, but not for sales if it potentially interferes with vendor sales. An application to attend a farmers market must be received two days in advance. A Farm Fresh RI staff member will promptly follow up with the group about the request. Would you like to help promote a Farm Fresh RI farmers market in your area? 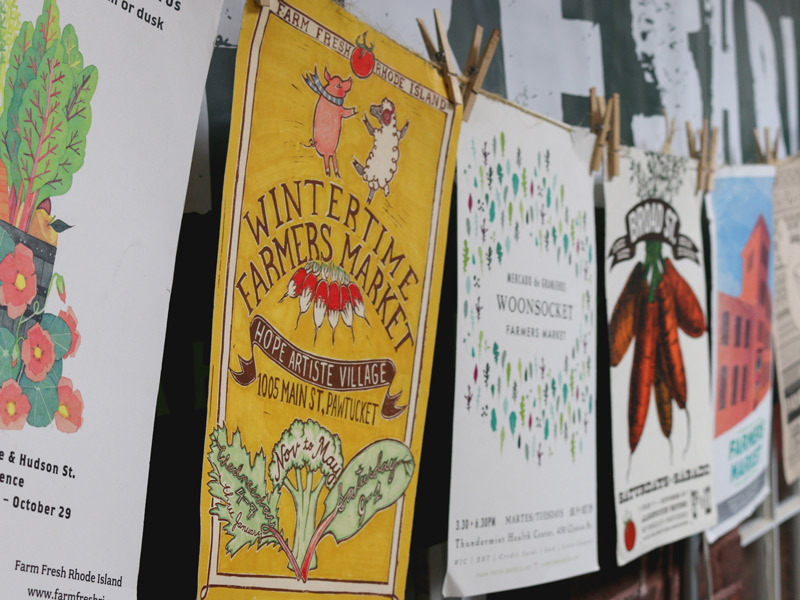 Download this seasonal flyer for the farmers market we're offering in Rhode Island right now.